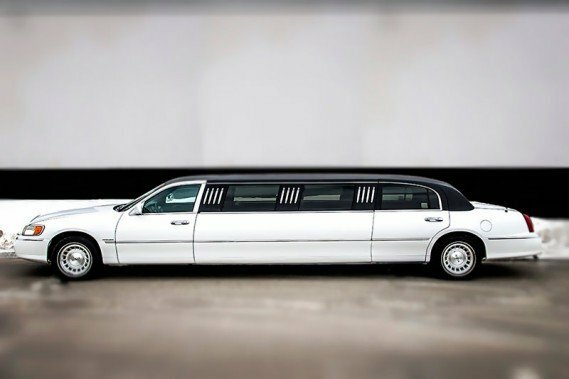 Take a look at all of our fabulous luxury vehicles available for rental. With all of the amenities you would expect and more. 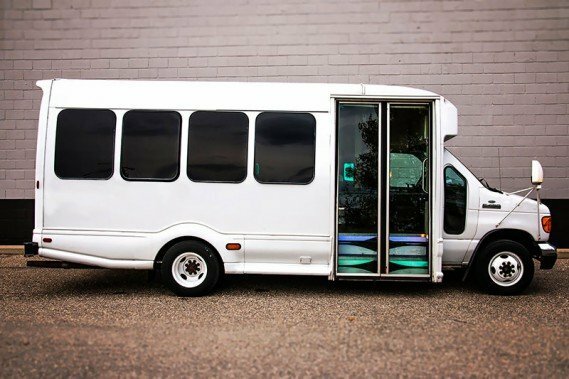 We have vehicles that can seat between 8 and 40 passengers to make sure every special occasion can be shared with those who are near and dear to your heart. Make sure you reserve your vehicle well in advance of your date to guarantee you get the vehicle you desire at the time you would like it. 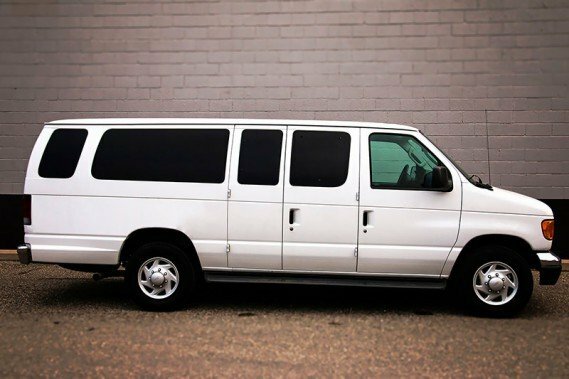 Our party vans are great for small group outings. 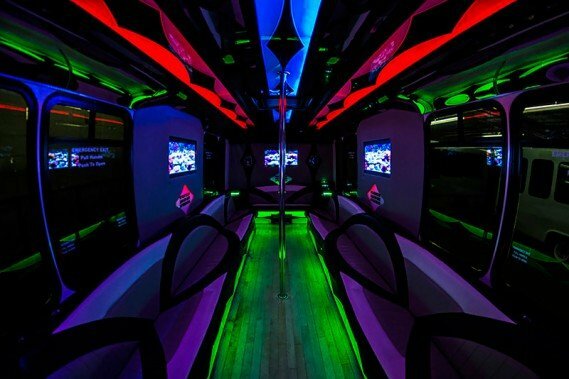 With a fully featured sleek interior you will be partying long before your arrival. 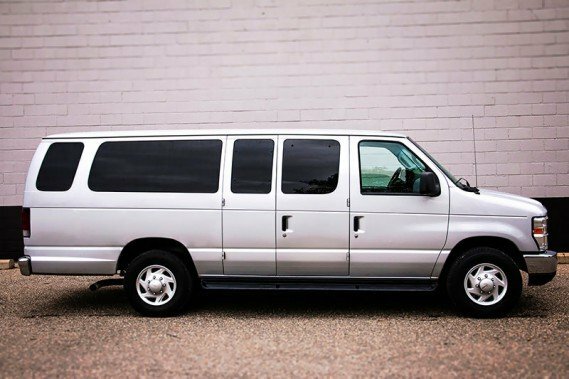 This is our smallest vehicle seating up to 8 people, below you will find our similar but roomier 10 passenger van if you and your guests need a just little more space. 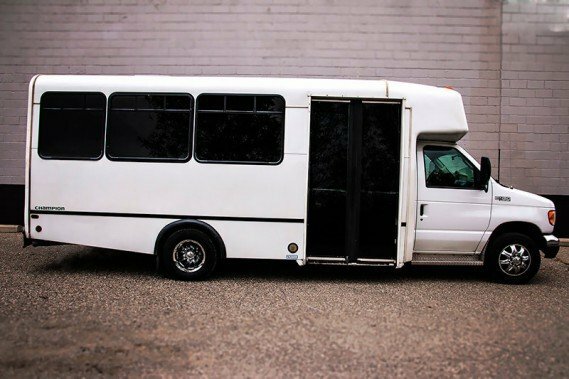 This 10 passenger limo van is not something you see everyday, well unless you work here but I digress, from the outside it appears to be a run of the mill work van, very inconspicuous on the outside. 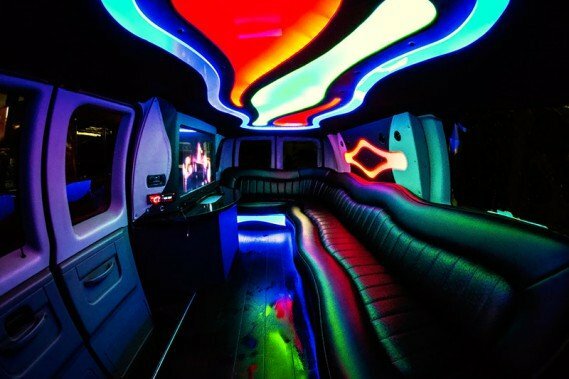 But once you step in the party begins, this van is loaded with neon lights, big screen televisions and so much more. 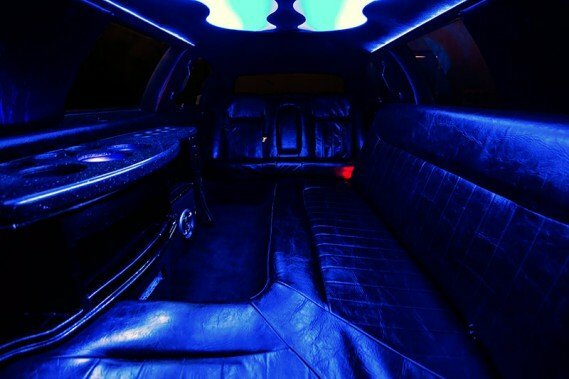 Another option for groups of up to 10 passengers is our classic Lincoln Town Car limousine. 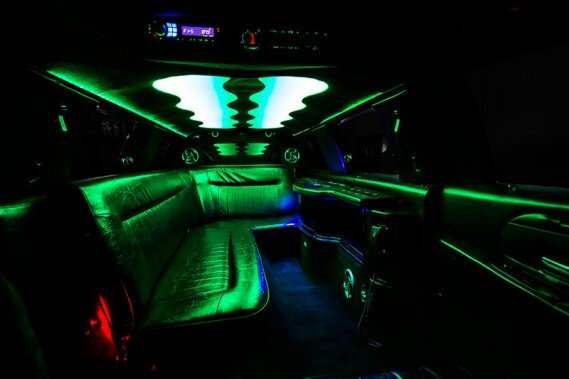 With it's timeless style this luxury vehicle will have you feeling like rock star. 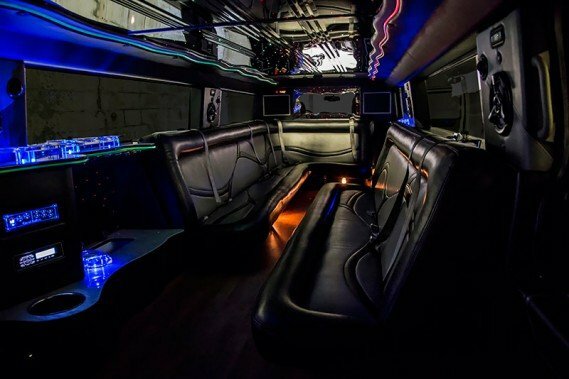 This limo is equipped with a wet bar and cup holders, as well as a high end stereo system and LED mood lighting which provides a soft glow as it reflects off our leather wraparound seating. 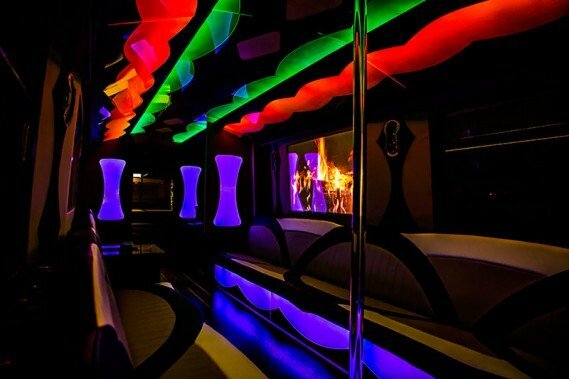 Surprise your girlfriend or your wife with an evening of intimate moments inside our Date Bus. 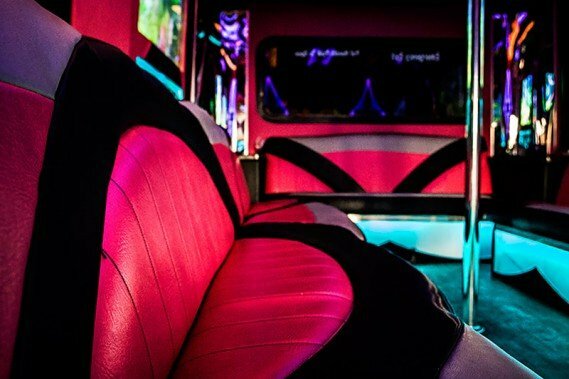 Equipped with lovely bar area, lovely LED lighting setup, soft, plush leather interior, a high definition television screen and thousands of music options to set the mood, you will be all set for a wonderful night out. 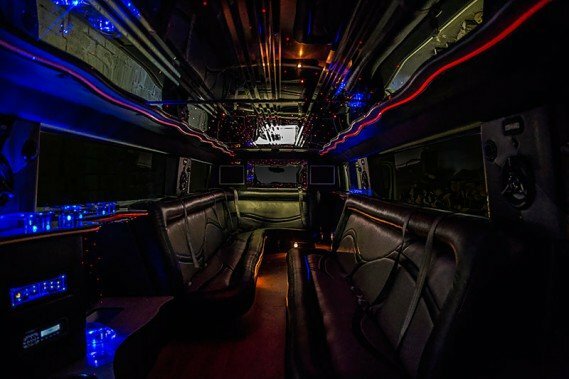 Considered by many to be the most popular vehicle a limo company can have in it's fleet, our 18 passenger Hummer is perfect for nights you want to arrive in style and stand out from the crowd. 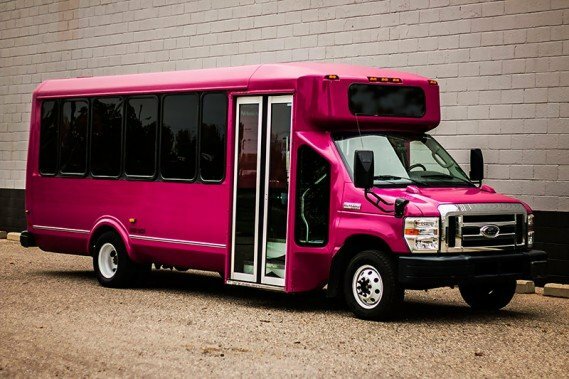 Our H2 Hummer is great for weddings and bachelor parties as well as bachelorette parties though many bachelorettes prefer our gorgeous Pink Party Bus. 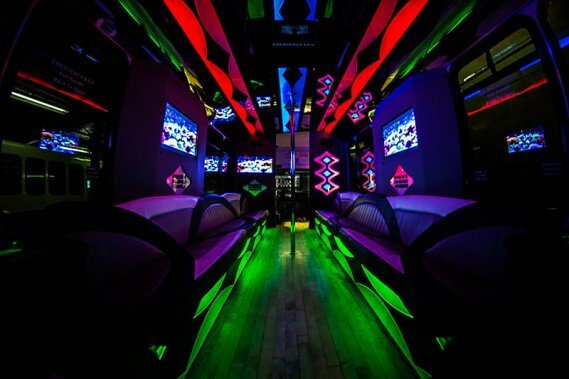 Celebrate your birthday with close friends inside our Birthday Party Bus and have the best birthday party ever. 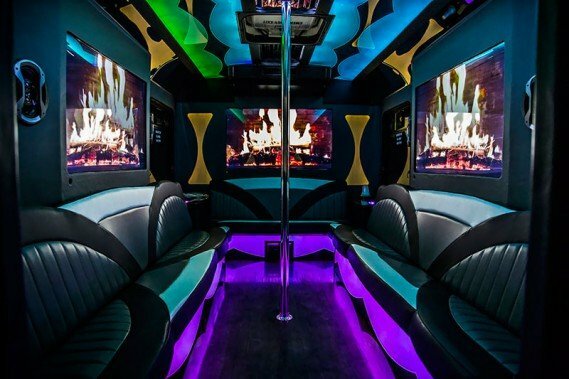 This bus features tri-tone leather seating, flat screen HDTVs with DVD/Blu-Ray inputs, dazzling neon lighting, hardwood flooring, a dance pole and so much more. Planning a family getaway this weekend? 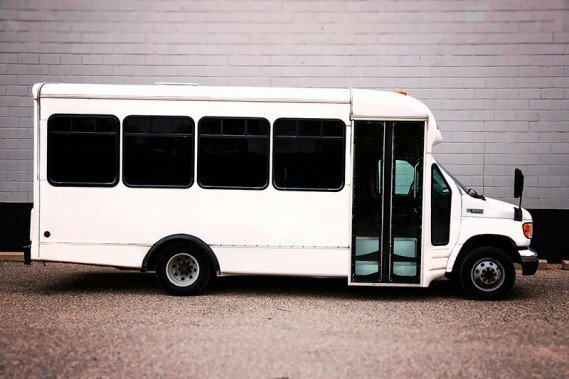 This Family Outing Bus has all the amenities that will make your travel fun and more exciting, especially for the kids. 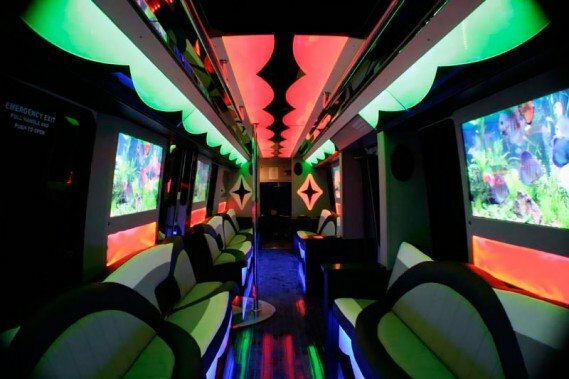 This bus is equipped with flat screen television sets, comfortable leather seat, beautiful hardwood flooring. bar areas which are stocked with ice and a profession sound system. 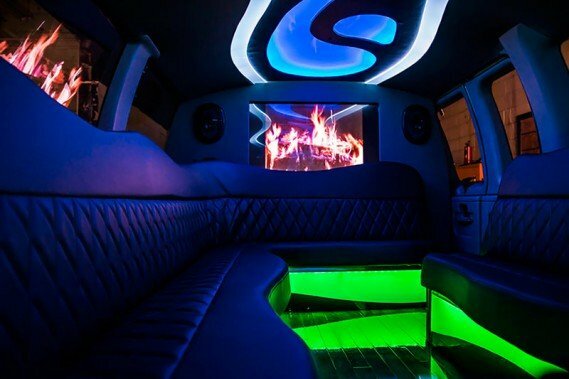 With a stainless steel dancing pole, plush leather seating, television, and a high end stereo system with two twelve inch sub woofers, you are in for a great night no matter the occasion. 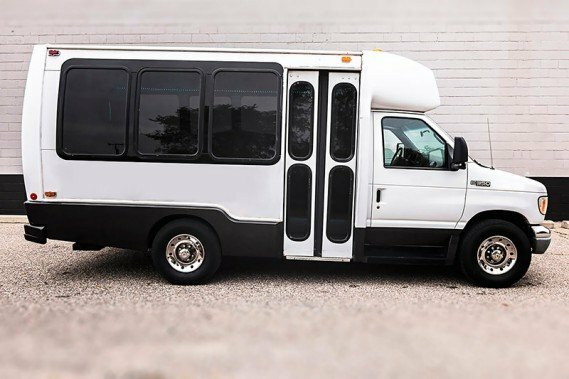 Our 22 passenger is popular for bachelor and bachelorette parties, birthday celebrations, or just bar hopping with up to 22 of your favorite and best friends. 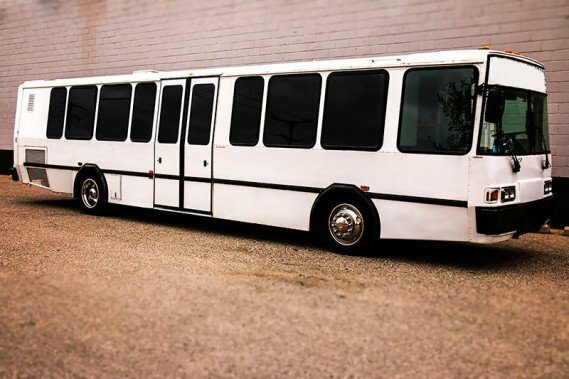 Our 22 passenger bus is so popular we had to add two of them to our fleet. 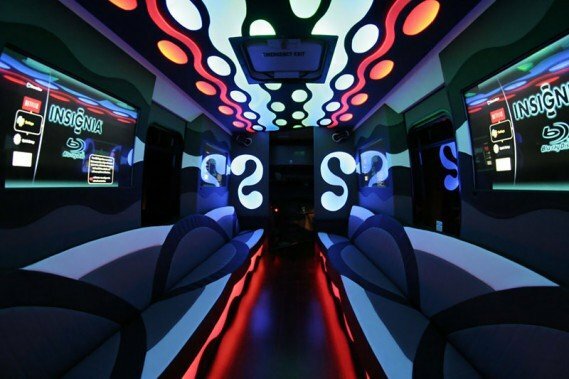 This bus will features ambient lighting throughout, with professional handcrafted leather seating and flooring, We have LED panels on the ceiling along with flat screen TVs on the walls. 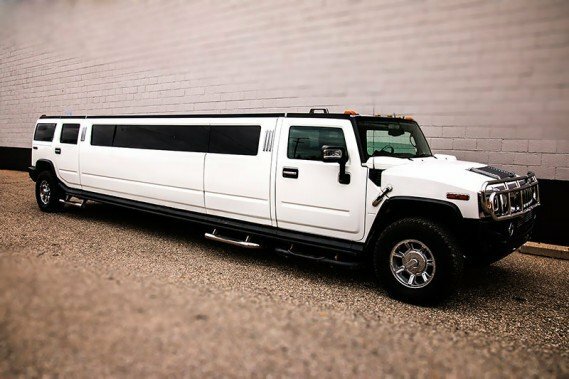 Our customers love this vehicle, so make sure you reserve it in plenty of time before your event. 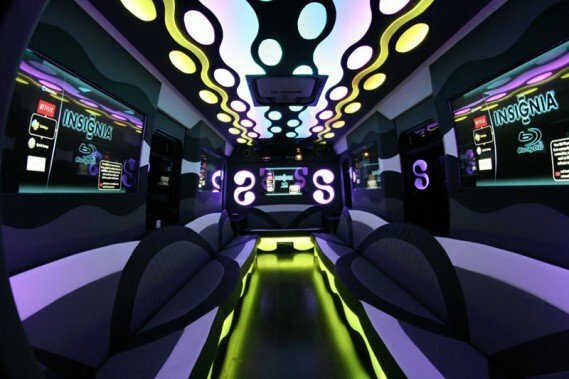 Next up is our 24 passenger limousine party bus. 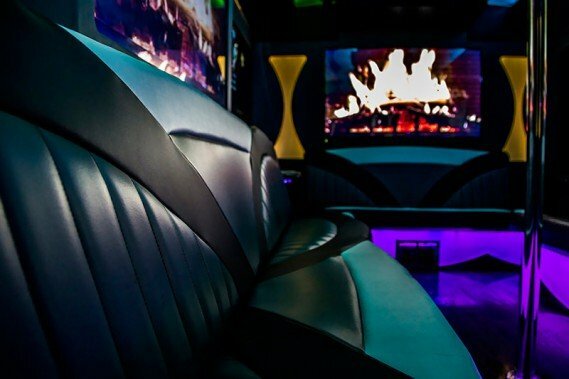 The interior of this bus is absolutely beautiful with it's lovely lighting showcasing it's newly installed custom leather interior as well as it's exotic hardwood flooring, multiple televisions, bar area and more. 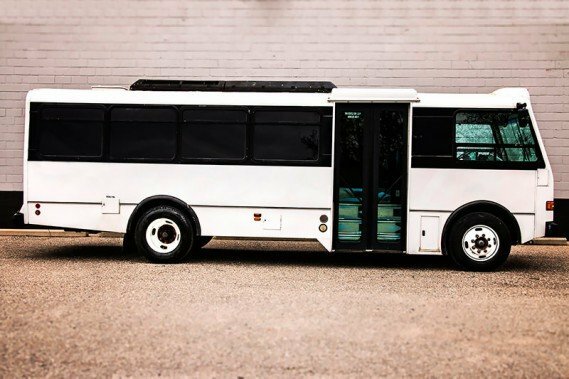 You certainly can’t go wrong with this beautiful bus! 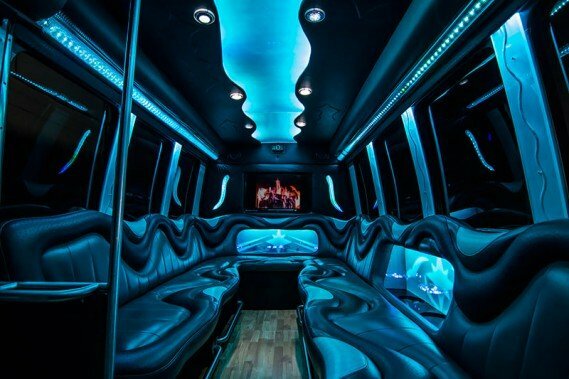 The preferred party bus for bachelorette and sweet sixteen parties, as well as occasional bachelor party pranks. 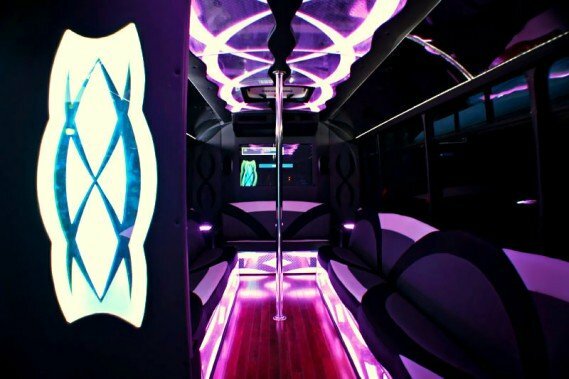 This party bus sports a custom pink paint job that is sure to turn heads, as well as a matching plush pink interior, dance poles, and hardwood dance floors. 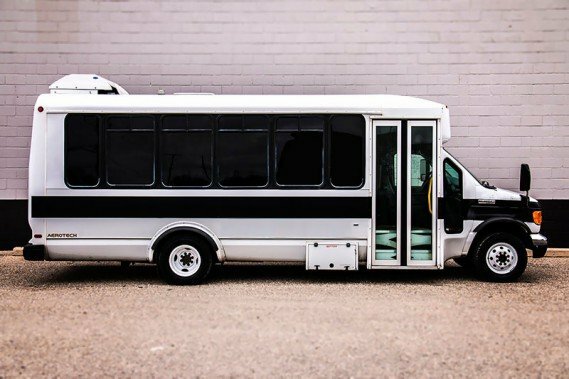 Reserve this bus today, because it surely goes fast! 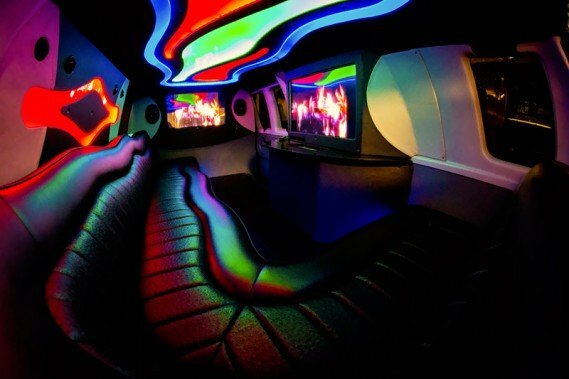 Our 30-seater party bus provides total privacy for intimate parties with friends and loved ones. 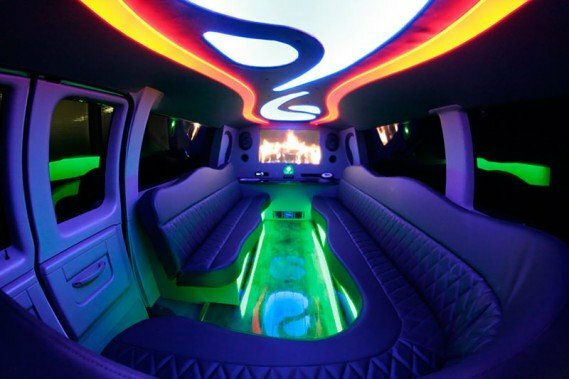 Interior can be customized to the theme of the party with it's outstanding lighting system that can be altered depending on the mood. 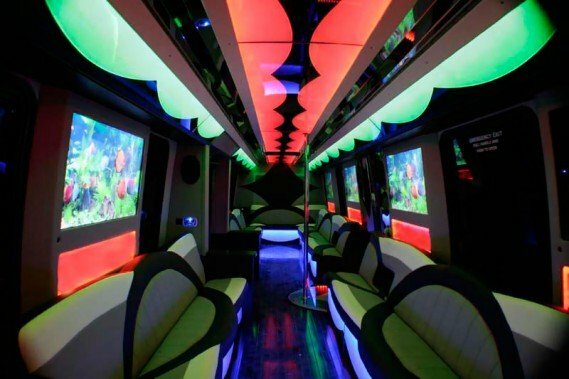 This bus is also outfitted with the latest audio and video gadgets and surround sound system. 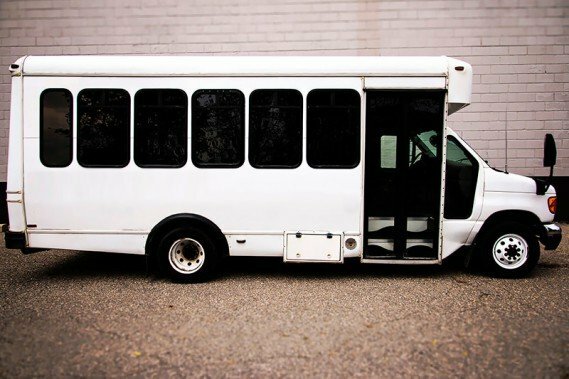 Our 40 passenger bus is our largest, and one of the most popular! 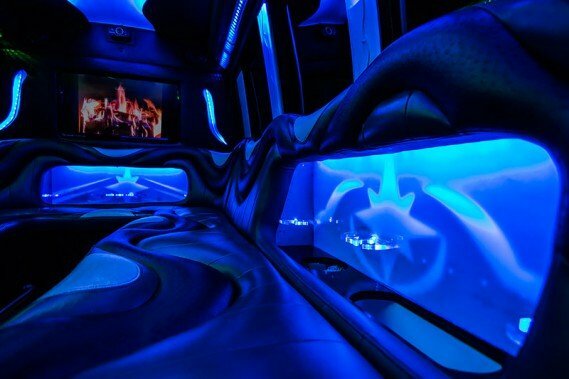 This huge bus feels more like a nightclub than it does a mode of transportation, which only serves to heighten the party experience. The best thing about this bus is that it doesn’t have a closing time! So enjoy the cocktail bar, coolers, ice and cups.